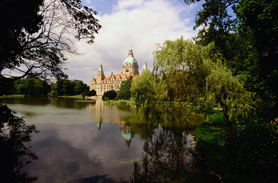 Hannover, the City of Trade Fairs, is quickly becoming one of the top tourist cities in Germany. Mainly known for the EXPO 2000 and all the many current Trade Shows, there is much to see and do in and around Hannover, not to mention the many fine restaurants and busy nightlife. Belin and Hamburg are both a short train trip or drive away, and Frankfurt is near as well.